THE PAN AMERICAN AIRWAYS FLYING BOAT, SAMOAN CLIPPER, in the harbour at Auckland, New Zealand. This flying boat made two trips across the Pacific from the United States to New Zealand, to survey the route for a regular service. On the first official flight from San Francisco, the flying boat met with disaster. THE problems of establishing air services to New Zealand are considerable. The Dominion is not, at the time of writing (1938), linked by regular services with the air route between Great Britain and Australia. Survey flights have been made and considerable preliminary work carried out. Much has been achieved by the American company, Pan American Airways, towards the establishment of a mail, passenger and freight service across the Pacific to link New Zealand with the United States. Because of the isolated situation of the Dominion and the geographical characteristics of the country, commercial aviation has developed slowly. The first regular air line was inaugurated in December 1934. Recently, progress has been accelerated and the four companies now operating aircraft services in New Zealand have cooperated to provide swift transport for passengers and mail. There are no great distances to be traversed as in the neighbouring Commonwealth of Australia, but the ruggedness of the country hampers fast surface transport, and the North and the South Islands are separated by a strait. These conditions provide wide scope for air transport. Many of the pioneer pilots who laid the foundation of civil aviation in New Zealand were men with experience of flying in the war of 1914-18. These men returned to the Dominion after the war and flew single-engined, open cockpit machines. The skill of these pilots enabled them to triumph over the many difficulties entailed by the scarcity of landing grounds and the lack of an aircraft industry in New Zealand. A number persevered with one-machine taxi services, and the hazards of some of the flights were fortunately not realized by their passengers. Often the passenger was a physician or a surgeon whose presence was urgently needed at a remote settlement. On journeys such as these the pilot had no aerodrome on which to land at the end of the flight. He had to look for a patch of level ground near the patient’s homestead, or search for a strip of clear beach. Sometimes he had to race against approaching darkness to land his passenger safely in the fading light. Since those days many landing grounds have been cleared. The link between New Zealand and British aviation is still strong, and a number of the present pilots learnt to fly, as did their predecessors, in Great Britain. Among the famous New Zealand pilots who learnt to fly in England are Miss Jean Batten and F. C. Chichester. Almost all the aeroplanes in use in the Dominion were built in Great Britain. The activities of the light aeroplane clubs - most of which were founded between 1927 and 1929 - are a feature of New Zealand aviation. These clubs have done much to make the Dominion air-minded. Members are taught to fly, and the clubs operate air-taxi services. Their machines are seldom idle. For example, a Miles Whitney Straight aeroplane was flown for 700 hours in the first nine months after it was bought by the Canterbury Aero Club. A similar machine owned by the Wellington Club flew for over 500 hours in six months. At the beginning of 1938 ninety-one aeroplanes were registered in New Zealand. Of these, forty-three belonged to clubs, twenty-five were owned privately, twenty were commercial machines, and three were experimental aircraft. Most of the aeroplanes were De Havilland machines, and included three Express Air Liners and four Dragon Rapides. On September 11, 1928, Sir Charles Kingsford Smith and his co-pilot, Flight Lieut. C. P. T. Ulm, accompanied by McWilliams, radio operator, and Litchfield, navigator, flew from Australia to New Zealand. This flight had a marked influence on aviation in the Dominion and the enthusiasm it aroused aided the formation of a number of aeroplane clubs. Nearly two and a half years later, on January 7, 1931, Guy Menzies, an Australian, accomplished the first solo flight over the Tasman Sea. He flew from Sydney to South Island, New Zealand, in the Avro Avian machine, Southern Cross Junior, which his fellow Australian, Sir Charles Kingsford Smith, had used in 1930 to set up an England-Australia record. Zealand. Chichester next decided to attempt to fly from New Zealand to Australia. Because of the prevailing winds the flight in this direction is more difficult than the flight in the opposite direction. 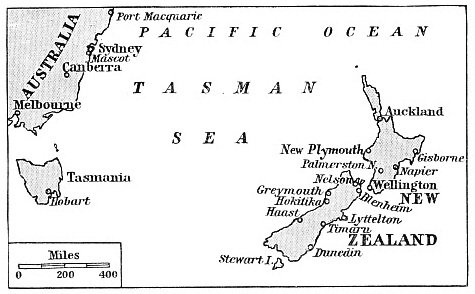 Chichester planned to stop first at Norfolk Island and then at Lord Howe Island during the arduous crossing. This added considerably to the distance, but provided stopping places at intervals of about 500 miles. Navigation was the great problem. Norfolk Island is only about five miles long, and Lord Howe Island is even smaller. Chichester fitted floats to his Gipsy Moth in preparation for the flight. He took off from the North Island on March 28, 1931, and, having flown by sextant observations and by dead reckoning, located the tiny, lonely Norfolk Island. Here he was delayed by bad weather for a day or two. Then he flew from Norfolk Island to Lord Howe Island and alighted. Later he reached Sydney. In appreciation of his flight, the Guild of Air Pilots and Navigators of the British Empire awarded him the Johnston Memorial Prize. This prize was subscribed for by the friends of Squadron Leader E. L. Johnston, O.B.E., A.F.C., navigator of the airship R 101, in which he was killed when she crashed at Beauvais, France, in October 1930. In 1933 Sir Charles Kingsford Smith flew the famous Southern Cross from Australia to New Zealand and back. A number of other flights followed, most of them from Australia to New Zealand in the direction of the prevailing winds. These were not commercial flights, and it became obvious that the operation of regular air services to New Zealand involved considerable organization. 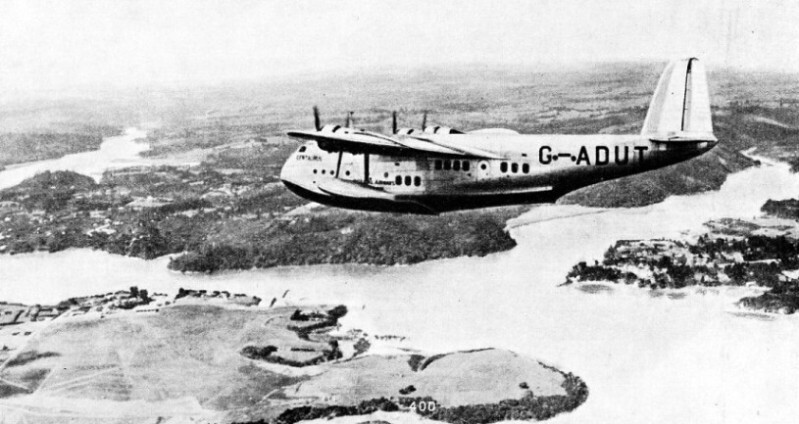 The flying boat is considered to be the best type of craft for connecting New Zealand, not only with the Empire air route, but also with the United States. The prominence given to the work of preparing the North Atlantic air route has somewhat overshadowed the efforts made by Britons and Americans to give New Zealand an air mail service, but these efforts are none the less noteworthy. The aim is to provide the Dominion with flying boats which will link her with Europe via Australia, and with North America by way of the Pacific Ocean. A New Zealander, Captain J. W. Burgess, who flew R.A.F. flying boats before he joined Imperial Airways, was in command of the flying boat Centaurus, which left Hythe, Southampton, for New Zealand, on December 3, 1937, and returned on February 26, 1938. The flight to New Zealand and back was made chiefly to survey the mail and passenger route. The distance flown was 32,498 miles, and the flying time was ten days three hours. Captain Burgess was accompanied by First Officer C. F. Elder, Chief Wireless Operator A. E. Lowe, Wireless Operator H. Dangerfield, Flight Engineer T. V. Broughton, and Flight Clerk H. Bingham, who acted as steward. THE DISTANCE FROM NEW ZEALAND TO AUSTRALIA is about 1,300 miles. There have been several notable flights across the Tasman Sea which separates the two Dominions. To fly across this sea from New Zealand is more difficult than to fly in the opposite direction, because the east to west flight is against the prevailing winds. The outward passage followed the Empire route to Darwin, Australia, but then diverged. 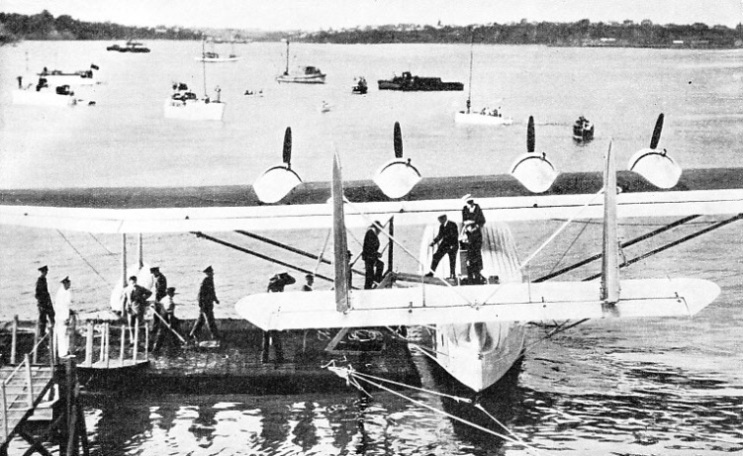 The flying boat flew by way of Groote Eylandt and Mornington Island to Karumba on the Gulf of Carpentaria, and then across the Cape York Peninsula to Townsville, on the Coral Sea coast of Queensland. From Townsville the machine continued its flight down the coast to Brisbane and then to Sydney. At Sydney a passenger, the Hon. T. W. White, Australian Minister of Customs, embarked for the first flight by a commercial flying boat across the Tasman Sea. The outward passage of 1,330 miles to Auckland was made in splendid weather at an altitude of 10,000 feet, navigation being by solar observations. During the visit to the Dominion, the machine carried out several survey flights and calls were made at the cities of Wellington, Lyttelton and Dunedin. At Auckland the Centaurus moored alongside the Pan American Airways flying boat Samoan Clipper, which had arrived the previous day on her second survey flight across the Pacific. When the Centaurus flew back to Sydney with her passenger she had to contend with head winds. Her height was only 800 feet for most of the ten hours’ crossing of the Tasman Sea. The flying boat visited various cities in Australia and then flew home. British. Australian, New Zealand and American experts have conferred in Wellington and have outlined the steps they consider essential for the establishment of a meteorological service in the south-western Pacific. It is proposed to have observatories in New Caledonia and the New Hebrides, and to establish balloon stations for upper-air observations in New Zealand, Fiji, Samoa and the Society Islands. These stations will work in cooperation with those already operating in the north and south Pacific. When the British and the United States flying boat services begin there will be a considerable saving in the time taken by mails to reach New Zealand. It is anticipated that if letters posted in England catch all the connexions they will reach New Zealand by the United States route in about eight and a half days, as compared with five weeks by ship or about fifteen days by Empire Air Mail to Sydney and thence by ship. The Americans had hoped to begin the service early in 1938, but suffered a serious loss. The Samoan Clipper, a Sikorsky S-42-B flying boat, was on the last stage of her first official San Francisco to New Zealand flight under command of Captain Edwin Musick. A message was received from him which reported an oil leak from one of the four engines. Captain Musick stated that he was jettisoning some of the petrol before attempting to alight on the sea. This message, sent on January 11, 1938, was the last. British and American warships began to search. The U.S. aircraft tender Avocet, having searched near the Samoan Islands, found the wreckage of the clipper. The jettisoning of some of the petrol was desirable because of the difficulty of alighting safely with the weight of petrol that remained in the tanks. Normally, all dump valves - for jettisoning petrol - in passenger-carrying aircraft in the United States have to be sealed, because of the risk of fire. The clipper, however, was not carrying passengers and was operating under special licence for experimental flights. Fuel had been dumped satisfactorily in test flights. It was surmised that the petrol, having been jettisoned, may have vaporized and been ignited by a hot exhaust pipe or by static electricity. Captain Musick had more than twenty years’ flying experience, and, except for the North Atlantic route, he had surveyed almost all the ocean routes of the Pan American Airways, including that from San Francisco, by way of Honolulu, Pago Pago (Samoa) and Kingman Reef to Auckland. Within the Dominion the regular air services now link the principal centres in the North and the South Islands. The first regular air mail service was begun by Air Travel (N.Z.) in December 1934, from Hokitika, on the west coast of the South Island, in the province of Westland, to Haast and Okuru. Okuru is some 135 miles along the coast to the south-west of Hokitika. The company is authorized to use Inchbonnie, Greymouth or Hokitika as airports and to operate taxi services to any place on the west coast where there is a licensed aerodrome. Ross, a few miles along the coast from Hokitika, is the railway terminus, and the inauguration of the air service proved a boon to settlers in the country outside the area served by the railway. Passengers include tourists, sportsmen and prospectors. It takes about an hour to carry passengers, mail and goods by air between places in this region as compared with several days by surface transport. The first aeroplanes on this route were D.H. Fox Moths, seating pilot and four passengers. A D.H. Dragonfly, driven by two 130 horse-power Gipsy Major engines, was introduced later. This pioneer company preceded the three other companies which are associated with the Union Steamship Company of New Zealand. THE FIRST MACHINES TO BE USED ON A REGULAR AIR MAIL SERVICE IN NEW ZEALAND were the De Havilland Fox Moth type. The first air mail service began in December 1934. It was from Hokitika on the west coast of South Island to Haast, and continued farther along the coast to Okuru, some 135 miles from Hokitika. The Fox Moths carried a pilot and four passengers. East Coast Airways began in April 1935 on the east coast of the North Island and linked up the two ports of Napier and Gisborne, 95 miles apart. Both towns link with important districts, and the inaugural twice daily service was later doubled. For a time the service was suspended while the aerodrome at Gisborne was improved, and then the route was extended south from Napier to Palmerston North. The machines are D.H. Dragons. Palmerston North is the headquarters of the Union Airways of New Zealand, and has the largest commercial hangar in the Dominion. One recently inaugurated service goes north-west to New Plymouth, 120 miles, and from there north for about 170 miles to Auckland, the largest city in the Dominion. Another service goes south from Palmerston North, across Cook Strait to Blenheim, the junction with the Cook Strait Airways. The distance between the two aerodromes is about 115 miles. From Blenheim the trunk route runs near the east coast of South Island, to Christchurch, a distance of about 160 miles. The southern end of the route is at Dunedin, 200 miles farther south. In June 1937 the company bought three Lockheed Electra 10A air liners to inaugurate a new service from Wellington to Palmerston North and to Auckland. The distance from Wellington to Palmerston North is ninety miles. D.H.86s are used on other services. Cook Strait Airways began in December 1935 to accelerate the transport between Wellington and the important centres in the South Island. Blenheim, on the southern shore of the strait, is forty-five miles from the seat of the New Zealand Government, and the journey by water is slow. From Blenheim the aeroplanes fly fifty-five miles across the neck of an isthmus to Nelson, saving a long detour by water. The towns are not linked by railway. There is also a direct air route between Nelson and Wellington. From Nelson the air route goes overland to Greymouth, thence to Hokitika to link with Air Travel services. The railways near Nelson are not linked with those that serve Greymouth and Hokitika, hence the Dragon Rapides on this route give greatly accelerated communications. The population of the Dominion is not crowded into a few cities and is more widely distributed than that of many other countries. The principal towns are on the coasts. The mountainous country makes road and railway building expensive, while sea communication is necessarily slow. In 1931 serious damage was caused by an earthquake, and aeroplanes then proved invaluable. At first communications were cut, but aeroplanes flew over the devastated areas to make surveys and to carry messages, doctors, medical supplies and radio operators. Five machines carried the sections of a million-gallons chlorinating plant. As early as 1920 and 1921, experimental flights were made in an attempt to begin an air mail service. Flights were made between Auckland and the northern extremity of the Dominion, and also between Christchurch and Timaru in the Canterbury province of the South Island, but the project was abandoned. As yet there are no modern facilities for night flying. In 1929 the New Zealand Parliament passed measures empowering local authorities to contribute to the cost of building aerodromes. Later, a plan was prepared to establish a chain of landing grounds to improve the mobility of the Royal New Zealand Air Force and the New Zealand Air Force (Territorial), and also to provide facilities for civil aircraft. The plan also provides work for the unemployed and considerable progress has been made. Air survey work began in 1930, when about seventy square miles were surveyed in the Hawke’s Bay District with such success that it was decided to map the whole of the Dominion. In March 1938 the first round trip by air from England to New Zealand and back was made. This was done by Flying Officer A. E. Clouston and Victor Ricketts in a De Havilland Comet, and they set up no fewer than ten new records by completing the flight in 10 days 20 hours 48 minutes. Their return journey was the first direct flight from New Zealand to Great Britain. Their time for the outward flight was 4 days 8 hours 7 minutes and they set out for England again on the same day as their arrival at Blenheim. IMPERIAL AIRWAYS FLYING BOAT CENTAURUS in flight near Auckland during its 1937-38 flight to New Zealand and back. The flight was made chiefly to survey the mail and passenger route of the proposed service to New Zealand. On the return flight across the Tasman Sea the Centaurus had to contend against head winds. She flew at a height of only 800 feet for most of the crossing, which took ten hours. You can read more on “Across the Pacific”, “An Australian National Hero” and “Australia’s Civil Aviation” on this website.